Altruism in its literal sense means to sacrifice ones well being in order to benefit someone else. It is well documented that animals are altruistic not only towards their own kin but also to other members of their species and other species. Here I will discuss not only the use of the word altruism in its literal sense, that of helping another animal at the risk of personal detriment, as for example when Velvet Monkeys worn others monkeys of the danger of predators by giving alarm calls even though they attract attention to themselves and increase their personal chance of being attacked, but in addition I will use the word altruism also to describe any selfless act used by animals generally to help one another and show compassion. Animals are capable of altruistic behaviours not only towards members of their own species but to members of other species often quite different than their own. Here are some examples. A Labrador puppy was the new arrival into a family who also had a cat who had been the only pet for years. The cute little puppy was loved by the whole family who lavished their attentions upon him. Well all except for the cat, who clearly resented the intrusion of another pet into the family despite the pups attempt to unconditionally love the cat anyway. Ignoring the cats hissing and attempts to scratch him he followed her everywhere and tried to play with her. It seemed no matter what the cat did the puppy was determined to love her. The weeks went by, it seemed the cat would never accept the puppy. Than the situation changed dramatically. One day the family herd a terrible screaming coming from the back yard of their suburban home. To their astonishment there was a lynx in the yard about to pounce on the cat who was trapped with no escape. Without intervention soon the cat would be a meal for the lynx. Than from out of nowhere came the little black Labrador who although still not fully grown challenged the lynx barking loudly with clear intention to bite, fully intent on mounting an attack. The cat ran for safety as the lynx turned towards the dog. The family hearing the raucous joined the Labrador yelling and shouting until having decided he had met his match the lynx retreated into the woods. From this time forwards the cat's attitude changed towards the Labrador, she now followed him everywhere, lay with him, licked his face and even allowed him to eat from her bowl, the two became inseparable. Hero Dog a Real Life Story of a Puppy and a Cat. A baby hippopotamus, named Owen and weighing about 300 kilograms (650 pounds), was swept down Sabaki River into the Indian Ocean, then forced back to shore when tsunami waves struck the Kenyan coast on December 26, 2004. 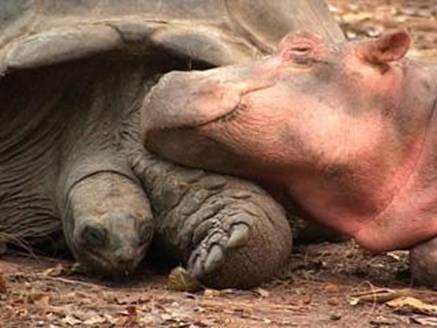 The orphaned hippo was traumatized at the loss of his mother, and adopted a male tortoise, about a century old, as a surrogate mother. The two established a strong bond. They would swim, eat and sleep together. The hippo followed the tortoise exactly the way he would follow his mother. If somebody approached the tortoise, the hippo became aggressive, as if protecting his biological mother. Hippos are social animals that like to stay with their mothers for four years. Here is an example of true altruism when one dog risks his own life to save another. Watch the incredible video of a homeless dog who rushes out into a busy road to save another dog who is injured braving passing traffic to drag his friend to the side of the road. A remarkable instance of altruism which he once saw exhibited by the king-crabs in a London aquarium is mentioned by Kropotkin in his work on ' Mutual Aid a Factor in Evolution/ One of these crabs had fallen on its back in a corner of the tank. And for one of these great creatures, with its saucepan carapace, to get on its back is, even in favourable circumstances, a serious matter. The seriousness was increased in this instance by an iron bar, which hindered the normal activities of the unfortunate crustacean. 'Its comrades came to the rescue, and for one hour's time I watched how they endeavoured to help their fellow-prisoner. They came two at once, pushed their friend from beneath, and after strenuous efforts succeeded in lifting it upright. But then the iron bar prevented them from achieving the work of rescue, and the crab again fell heavily on its back. After many attempts, one of the helpers went into the depth of the tank and brought two other crabs, who began with fresh forces the same pushing and lifting of their helpless comrade. We stayed in the aquarium for more than two hours, and, when leaving, came to cast a glance upon the tank. The work of attempted rescue still continued. More anecdotes from The universal Kinship. This one tells the heart-warming account of the altruism and compassion shown by a gander for his blind companion. Bell" the Dachshund is the proud mother of 2 felines. Along with her recent litter of puppies, Bell nurses, cleans and protects the kitties as if they were her own. Hit by a car a female swallow is fatally injured . With obvious love and compassion her partner brings her food. Millions of people cried after watching this picture in America and Europe and Pakistan. It is rumoured that the photographer sold these pictures for a nominal fee to the most famous newspaper in France. All copies of that newspaper were sold out on the day these pictures were published. And many people think that animals are not sentient beings. Adapted from Animal Angels, by Stephanie Laland (Conari Press, 1998). When her son died, Lana felt her whole world collapse. She became too depressed to even go out of the house. But Grizzly knew she had to go on, so one day he brought her one of her running shoes and then rifled through the closet and brought her its mate. When she protested that she just couldn’t move yet, he pulled at her sleeve. She started going out into the fresh air again. Lana began taking Grizzly to the pediatric floor of the Health Center where she did volunteer work. Perhaps because of the time he had spent caring for Lana’s son, Grizzly seemed to know just how to be gentle with sick children. The children loved him. For years he brightened their days and took their minds off the physical and emotional pain they were suffering. Even kids who fought with other kids calmed down around Grizzly. This account of Rambo the ram, a Jacob sheep with a good heart, demonstrates not only a mixture of emotions and intelligence but also the most amazing altruism. 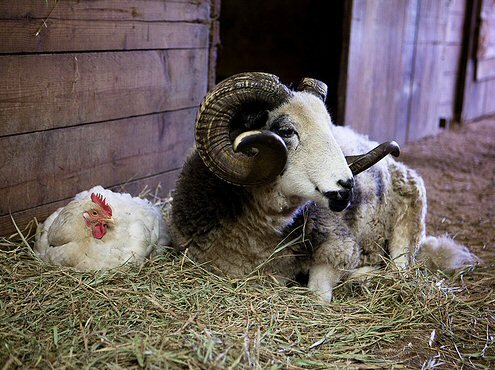 Rambo the ram lives at Catskill Animal Sanctuary (CAS) in Saugerties, NY having been rescued along with seventeen other animals from an appalling situation of neglect. Unfortunately in the beginning Rambo was not appreciative of his new home and the care and attention he received, enraged he charged when anyone approached. The other animals rescued with Rambo were soon adopted but not Rambo who continued his rage filled aggression. A year passed, his rage seemed unabated, advice from breeders was to put him down but Kath Stevens, founder of (CAS) and others at the sanctuary persisted "at Catskill Animal Sanctuary, the mantra "in his own way, at his own pace" describes our healing process. And so we waited, speaking gently to the explosive boy and protecting ourselves from injury". During his second year at (CAS) Rambo's attacks became less frequent and less intense. One day Rambo showed what a gentle soul lay beneath all the aggression when he came to the rescue of two turkeys, Cliff, who was blind, and Chuck who befriended and protected him. During the daytime the two birds were taken to a spacious enclosure and brought back to their stall at night. However one bitter cold night in November this routine was forgotten. "One bitter wet evening, my dog Murphy and I rushed to the barn for night check. Rambo lay in the barn aisle just outside his pal Dino's stall (we had abandoned our effort to enclose him in his own space). On this night Rambo stood and looked me straight in the eye, wanting a treat. I obliged with a pear procured from the kitchen, then walked over to Chester to begin my rounds"
"All was well at CAS. Or so I thought." As I did each evening, I turned around at the end of the long aisle to call goodnight to my friends. But before the first name left my lips, Rambo charged up to me, stopped dead, looked up with is great yellow eyes and bleated. "Something's wrong," he said. No matter that what he in fact said was "Baaa-hh" . . . his communication was perfectly and instantly clear. It was the first time I'd heard his voice. "What?" I asked him. "Show me what's wrong." The proud beast marched half-way down the aisle and made a 90-degree turn into the empty turkey stall. The turkeys!! In the frenzy of a hectic day, we'd forgotten to bring them in. Stunned by what I'd witnessed, but concerned about the birds, I thanked our guard sheep and ran out to the turkey yard, accompanied by Rambo and Murphy, Chuck was cowering at one end of their enclosure, his head tucked in a futile effort to stay warm. Cliff was outside their pen, motionless in a shallow puddle. "Oh, my boy, I am so sorry," I whispered as I approached Cliff. Scooping the animal into my arms, I carried him into his dry, safe space, Rambo at my side the entire time. We repeated the process with Chuck. I toweled off the birds, kissed them on their rubbery heads, checked food and water and closed the door behind me. "It was time to thank Rambo. In the darkened, hushed barn aisle, I sat on my knees and looked deeply into his eyes. "Thank you, Rambo. Thank you for telling me about the turkeys. What a good job you did. . . what a good, good job." I took his face in my hands as teared rolled down my cheeks." "What had just happened? That a sheep was aware that the turkeys were outside was impressive enough. That he figured out how to tell a human blew me away. But most astoundingly, Rambo had just shown concern for two animals of a different species, and had known that I would help them. Rambo, the sheep full of rage, seemed to know the compassionate purpose of Catskill Animal Sanctuary. Rambo had empathy. My head was spinning. Was this possible? I took his face in my hands. "Okay, boy," I whispered, looking into his eyes. "If this is who you are, you've got a big job ahead of you." Rambo continues his deeds of altruism as he welcomes new animals to the sanctuary, comforts those who are sick including helping a depressed pig to eventually leave his self imposed confinement in his stall. Animal Camp Lessons on Love and Hope from Rescued Farm Animals. Where the Blind Horse Sings: Love and Healing at an Animal Sanctuary Love and Healing at an Animal. An absolute feast of delightful accounts of animal sentience. A story of jealously and competitiveness between a sheep and two hens for the attentions of Rambo the ram. Crows show benevolence by feeding their blind and helpless companions, and monkeys adopt the orphans of deceased members of their tribe. Brehm saw two crows feeding in a hollow tree a third crow which was wounded. They had evidently been doing this for some time, for the wound was several weeks old. Darwin tells of a blind pelican which was fed upon fishes, which were brought to it by its friends from a distance of thirty miles. The devotion of cedar-birds to each other and their kindness to all birds in distress are well known to every student of ornithology. Olive Thorne Miller tells of a cedar-bird that raised a brood of young robins that had been left orphans by the accidental killing of the parents. Weddell saw more than once during his journey to Bolivia that when a herd of vicunas were closely pursued the strong males covered the retreat of the weaker and less swift members of the herd by lagging behind and protecting them. A remarkable instance of altruism which he once saw exhibited by the king-crabs in a London aquarium is mentioned by Kropotkin in his work on ' Mutual Aid a Factor in Evolution/ One of these crabs had fallen on its back in a corner of the tank. And for one of these great creatures, with its saucepan carapace, to get on its back is, even in favourable circumstances, a serious matter. The seriousness was increased in this instance by an iron bar, which hindered the normal activities of the unfortunate crustacean. 'Its comrades came to the rescue, and for one hour's time I watched how they endeavoured to help their fellow-prisoner. They came two at once, pushed their friend from beneath, and after strenuous efforts succeeded in lifting it upright. But then the iron bar prevented them from achieving the work of rescue, and the crab again fell heavily on its back. After many attempts, one of the helpers went into the depth of the tank and brought two other crabs, who began with fresh forces the same pushing and lifting of their helpless comrade. We stayed in the aquarium for more than two hours, and, when leaving, came to cast a glance upon the tank. The work of attempted rescue still continued. Since I saw that I cannot refuse credit to the observation quoted by Dr. Erasmus Darwin that the common crab during the moulting season stations a sentinel, an unmolted or hard-shelled individual, to prevent marine enemies from injuring moulted individuals in their unprotected state.' Walruses go to the defence of a wounded comrade when summoned by its cries for help. Romanes tells of a gander who acted as a guardian to his blind consort, taking her neck gently in his mouth and leading her to the water when she wanted to take a swim, and after allowing her to cruise for a time under his guidance and care, conducting her back home again in the same thoughtful manner. When goslings were hatched, this remarkable gander seemed to realise the inability of the mother to look after them, for he took charge of them as if they were his own, convoying them to the water- side, and lifting them carefully out of the ruts and pits with his bill whenever they got into difficulty . The disposition to go to the aid of a fellow in trouble is one of the most characteristic traits in the psychology of the swine. A single squeal of distress from even the scrawniest member of a swine herd will bring down on the one who causes this distress the hair-raising wrath of every porker within hearing. This trait has been considerably reduced by domestication, and in those varieties in which degeneracy has gone farthest it scarcely exists. But it is exceedingly strong in all wild hogs. Animals as low in the scale of development and as proverbially cold as snakes have been known, when educated and treated with kindness, to manifest considerable affection" for their friends and masters. The New York Herald, in its issue of July 2, 1901, contained an account of the death of Charlemagne, a chimpanzee who died a short time before at Grenoble, France. This anthropoid at the time of his death was the most popular inhabitant of the town. His popularity was due to his good-nature and intelligence, and especially to the fact that a few years before his death he had saved a child from drowning in a well. The ape saw the child fall, and without a moment's hesitation climbed down the rope used for the buckets, seized the child, and climbed out again by the same rope by which he had descended. The people of the town thought so much of him that they followed his remains to the grave, and the municipal council voted to erect a bronze statue to his memory. Watch an amazing video of altruism as an hippo rescues an impala from the jaws of a crocodile. In the next video a group of female elephants are determined to rescue a baby who is drowning. In 1989 while two Australian teenage boys were enjoying surfing and playing with dolphins their pleasure was spoiled by the appearance of a tiger shark who turned his attention to one of the boys taking a bite out of his surf board and knocking him into the water. Now wounded the boy feared for his life as the shark turned to attack again. The attack however was thwarted by the dolphins who working together chased the shark away. Although the boy received some wounds thanks to the quick action of the dolphins he lived. * I have endeavoured to provide accurate references for stories found on the internet however some of the stories are so frequently repeated that the original source is not easily identifiable. If you see any story here that is yours for which you have not been credited for have not given permission for its inclusion please Contact me.